I'm obsessed with finding shower products which suit my skin type and allergies but won't empty out the bank account. Avoiding linalool means that most of my skincare routine has become fragrance free but I'm now compromising on ingredients and looking at brands that offer scent without linalool. I still have to be extremely careful with perfumes but I opt for brands that I feel a sense of trust. As my husband and I tend to share the products in the bathroom it's nice to find shower gels that we can both use. Benecos ticks a number of boxes for me. Products are suitable for Vegans and certified Natural with BDIH. They offer five fragrances of shower gel and I opted for the Apricot and Elderflower which is free from linalool (worth noting so is the Pomegranate and Rose). Benecos Apricot and Elderflower Shower Gel has a really delightful fruity fragrance which is delicate and not overpowering. For my fellow ingredient geeks, Benecos are using the surfactants/foaming agents sodium coco-sulfate, coco-glucoside and lauryl glucoside. I use shower gels in conjunction with a Konjac Body Sponge, not only is it gentle on my skin but it helps the product go further and generate a good lather. Benecos gets a thumbs up from me so far this shower gel hasn't caused noticeable irritations and doesn't leave my skin feeling tight or dehydrated. 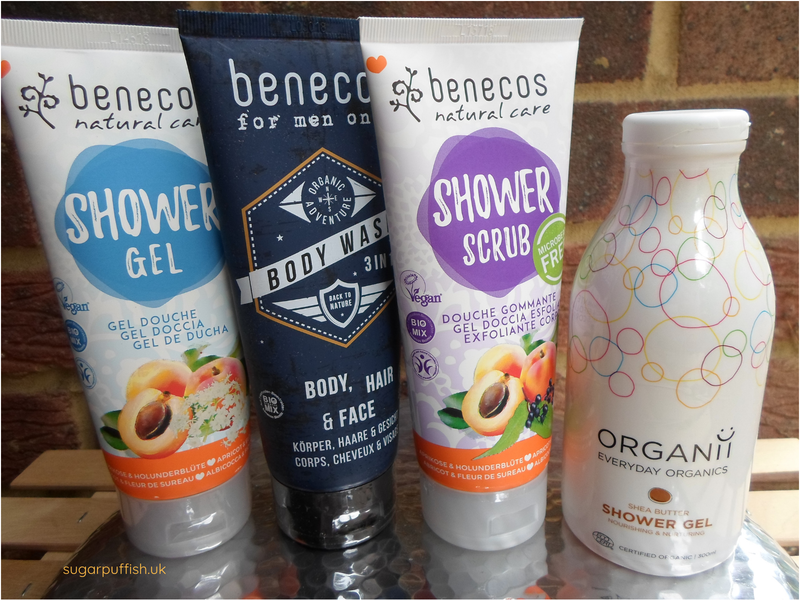 Alongside the shower gel I've been using the Benecos Shower Scrub (Apricot & Elderflower). I'm very fussy with scrubs and I dislike anything too scratchy or oily. This scrub was chosen for a particular task of tackling a dry and rough patch on the top of my arm. Benecos shower scrub uses apricot kernels for exfoliation. This ticks the box for eco-friendly and the particles are a nice size; gentle but effective on my sensitive skin. The scrubby almond bits are suspended in a cream rather than oil which I find easy to work with and it doesn't make the bath slippery. I like how my skin feels after using the scrub; it's noticeably softer, smoother and moisturised. As with the shower gel I enjoy the fragrance. I decided to pick up the Benecos For Men Body Wash 3 in 1 for my husband. This one does contain linalool so we can't share it. I must admit we find the marketing "for men" rather amusing but each to their own. If you enjoy a herbal scent over a floral one then I see no reason why this can't be a unisex product. My husband has enjoyed this shower gel, although he wasn't keen on the product for his hair he says it's perfectly acceptable as a body wash.
Just to mix it up a little I also picked up the Organii Organic Shea Butter Shower Gel. Organii also have five fragrance options and it would seem only the Aloe Vera & Bamboo scent contains linalool, it's not listed on the Shea Butter, Liquorice, Strawberry and Argan (please double check before ordering as formulations can change). Organii is also a Vegan brand and they are Eco Cert Organic. The surfactants in their shower gels are ammonium lauryl sulfate and cocamidopropyl betaine, two ingredients I have been known to avoid but now I am looking to use with caution. I opted for Shea Butter because it's an ingredient that works well for dry and sensitive skin. Of course this is a wash off product but I'm hoping it imparts some shea butter goodness along the way, even if it only temporarily protects with gentleness. This Organii shower gel does contain parfum but the scent is very gentle, I'm not sure how to describe it exactly but I like it. If you'd like to try these products they are available from Love Lula. I view both brands as affordable at £5.95 each. The only difference is bottle size, Benecos Shower Gels are 200ml and Organii, 300ml. I review products for Love Lula every month, if you missed the last one you can follow this link - Dr Botanicals & Mallow + White. Disclaimer – contains affiliate link. I'm part of the Love Lula Blogger Programme and can select PR samples each month, I am not obligated to review and all opinions are my own. Prices correct at time of publication.